My grandfather died in 1962. I was ten that year and my memories of him are dim. I know that Grandma slipped on the ice and broke her hip. I don’t know when, but I have no memory of her walking without a walker or eventually trapped in a wheelchair. I remember Grandpa gently and tenderly taking care of his wife. I remember him making the house more accessible for her before handicapped accessible was widespread. They lived over 500 miles away from us and we didn’t see them often. 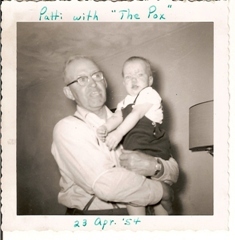 Every time we did see them, Grandpa proudly asked if I remembered having the chicken pox and being so miserable. He was the only person who could make me happy. I was about one and a half years old at the time and I remember nothing. But he was always so happy to remind me that once in my life, he had been my hero, my savior. He, and he alone, even more than Mommy or Daddy, he had comforted me. That thought seemed to comfort him. I got so sick of hearing that same tired story. He never tired of telling it and I listened. Probably without much grace. It was late fall/early winter when he died. I came home from school and learned that he had suffered a heart attack and died in his green recliner. I can still remember the first thought that ran through my head. “Who will tell me that story now?” and I knew I would miss hearing it. I don’t know how, when, or even why, but my own father came to own Grandpa’s jacket. It is a tan suede and buttery soft confection. 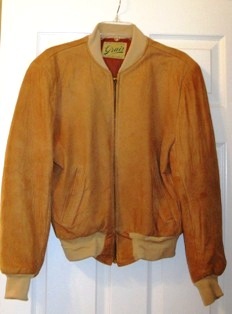 The tag in the lining says it was made by Sportswear with Grace by Grais. I just looked it up on the Internet. Rubin Grais was a Russian Jew who emigrated to Chicago and made leather goods. I can attest to his skill. He produced jackets and coats in the 1940s and 1950s. I still have no idea how old Grandpa’s coat is, but now I know a little more. It got cold again recently and I got Grandpa’s jacket out. It is still buttery soft, maybe even more than when it was new. The new collar, cuffs, and waistband now look normal to me. The lining is in perfect condition. The jacket is a little big for me, but that gives me plenty of room for a sweater underneath. Rubin did a great job in making his jackets. This one has lasted for decades. It has lasted through three owners.